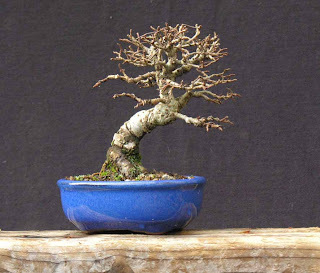 This is my shohin “nire” elm, just 11cm tall from the top of its pot. According to the book “Garden Plants of Japan” by Ran Levy-Yamamori and Gerard Taaffe the Japanese name for Ulmus japonica is haru nire meaning “spring-flowering elm”. Gerard Taafe also refered to haru-nire, as Ulmus davidiana var. japonica in an article for The Japan Times (27th May 1999) about Hokkaido University Botanic Garden. The keyaki part of the cultivar name is also the Japanese common name for Zelkova serrata, but the leaf of the plant commonly referred to as nire elm has an aesymmetrical leaf base, seen in genus Ulmus but not genus Zelkova. 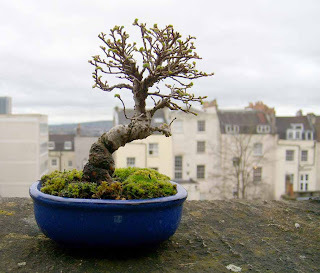 I consider that the plant commonly referred to in bonsai as nire elm is probably a cultivar of Ulmus parvifolia dveloped specifically for bonsai in Japan. 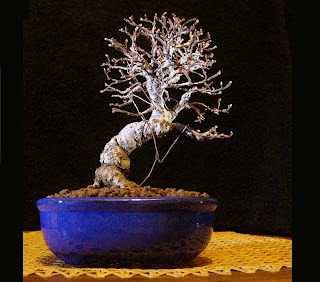 Certainly it is eminently suitable for cultivation as bonsai and would probably be an excellent hedging plant too. From the top: the tree soon after its import from Japan late in 2006, after some refinement in early 2008, and further on in 2009. The tree will look really good by 2011, I will post a virtual of this tree soon and I will repot it this year in a more suitable container.